Brushing a child’s teeth – twice daily? Doesn’t always happen when you’re a busy mama. Flossing that same child’s teeth daily? Only for the most conscientious of mothers! So when does falling a little short on your child’s dental hygiene really make the difference between a sticker and a cheap toy ring vs. tears and a $1,000 pediatric dental bill? For us, the latter (no, 1,000 bucks is NOT an exaggeration) took place because of a simple drinking habit our toddler had. 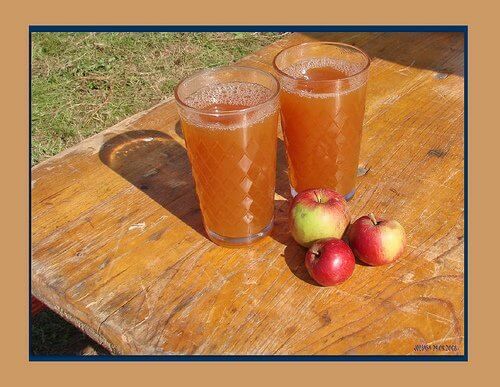 Weaning at 15 months, he was indeed a teetotaler, but his preferred beverage was a cup of apple juice. He refused to drink cow’s milk. He turned his nose up at water. This boy was stubborn. He seemed to prefer dehydration to everything but, you guessed it, apple juice. His will was stronger than mine and I finally quit fighting the battle. I rationalized that by diluting the cup half and half with water and by buying 100% juice as often as we could afford it made it easier to swallow for me. It did. Until he turned 5. It was then that the dentist informed us he needed 3 cavities filled. The doctor really wanted to turn those fillings into root canals, but said he would try to avoid it at all costs. One tooth had to be pulled altogether and at least two more teeth were in bad shape, but they should fall out on their own naturally within six months so he elected to leave them. After that detail, it would lead you to believe we never brushed the poor tyke’s teeth. I have to admit that we were not always the picture-perfect example of teeth brushing habits, but what has been most interesting to us – and to our dentist – is that we have three other children with lovely, white smiles and NO CAVITIES. If his teeth didn’t get brushed or flossed, neither did the teeth of the other three. So, what was the difference? Apple juice. According to 21st Century Dental in Irving, Texas, loss of tooth material begins at a pH of 5.5 or perhaps a little higher. Apple Juice has a pH of 3.4 so it would seem that that number is not high enough to eat away at my poor baby’s tooth enamel. The problem, says our dentist, is found in the natural sugars. Hooked On Juice reports that apple juice – even the organic, 100% juice kind – contains 10 teaspoons of sugar in every 12 oz of fluid. Based on their research for sugar content, my son would have been better off drinking a soda out of his sippy cup than the fruit juice. Amazing statistics. I don’t know that I would have believed them so easily if it weren’t for my family’s real world test case. Fortunately for our children and our wallets, the rest of us drank before and still do drink mostly water. Finally, even the stubborn juice drinker has seen the error of his ways and become a water convert. It is, after all, 100% sugar-free! How do you keep your child’s teeth healthy? How did you convince your little one to give up the juice? I have a similar problem with my 2-year-old. She’ll drink about a cup of milk each day, and then refuses anything (water, more milk, etc) that isn’t sweetened in some way. I usually limit her to one cup of diluted juice, and try to make up the rest with high-moisture-content foods (like yogurt, soup, etc.). I can still tell she’s getting dehydrated on some days, though. Recently I went to a WIC appointment where they were preaching the same message. It’s good to see that people are learning the need to moderate juice intake. Hopefully my little fella likes water! Wow, that’s a wakeup call! Interesting. I think that its best in one way to never introduce juice, then they don’t know what they are missing! I was told its better to drink it with a meal than on its own. We don’t offer anything but water (or breastmilk for the toddler who is still nursing) between meals. Occasionally (like 1 or 2 times a month or with company) we offer juice and then its with a meal. I’m still hoping to find out what people do once they have a cavity. I read on here I thought that those tips are coming soon. Anyone have anything to share on that? I got my first cavity ever at 27 I was so shocked. I was in the same boat with my son. He had his first fillings/root canal/crown at age 3. Ick. He drank a TON! Our dentist also told us that some kids just have weak enamel and there isn’t much you can do to prevent…but, cutting back sugar is ideal. My husband had bad teeth as a kid (and grew up drinking milk and water) so it could be a combo of both in our case. My daughter who is 2, will drink water and I had been pushing it hard for awhile but I’m in school (finishing up my degree in Nutrition/Dietetics no-less, lol) and those good habits are slipping. We were diluting 50/50 but then we have juice boxes on hand that don’t get diluted. Time to make some adjustments! Have you read “Cure Tooth Decay: Heal and Prevent Cavities with Nutrition” by Ramiel Nagel? It’s eye-opening and we tried some of his methods for 6 months (after my son was told he had a few more cavities at age 5) but b/c he has a heart condition, we felt we couldn’t hold off any longer so we had the fillings done. @Julie H, Wow – so sorry to hear about your baby’s heart condition and cavities. What a full plate! Plus, at least the juice doesn’t have high fructose corn syrup and carbonated water and caramel among other atrocities! I am certain that I made the better choice of juice over a caffeinated beverage, but it did surprise me when I learned of the sugar comparisons. I can totally relate! My 4 year old just had 3 crowns and a filling done. What an experience! Don’t even get me started on how nervous I was about the sedation but anyway, another topic for another day. Part if it my doctor/dentist both told me was because he has bad teeth. The other part, which both of them said was get rid of the juice! I was young and uninformed when i had him so I gave him more juice than i care to admit (and fruit snacks, but I digress ) up until recently. We don’t buy juice anymore and he is plenty happy with water. My problem is the milk drinking- he will not drink milk unless it is chocolate milk. (once again, I was young and un informed). He would rather drink water than milk. So, I make my own homemade chocolate syrup and once a day he gets chocolate milk. the rest is water. Katie, how do you make chocolate syrup? i stopped buying it at the store ages ago b/c of all the HFCS, but love to have it on hand for treats. thanks! @Katie, Don’t beat yourself up, mama. We do the best with what we have and know. In addition to my son’s story about juice, my daughter only took chocolate milk when she was little, too. I thought, at the time, that it was more important for her to have the milk than not so I gave it to her. We are only doing what we think is best and when we learn something new, we make the changes accordingly. I’d also love to have your chocolate syrup recipe! YUM! Yes, almost everything we eat either has sugar or breaks down into sugars. Like a cracker for instance will break down into starch which breaks down into sugars. Milk has lactose “milk sugar”. It is also not how much but over how long of a period of time. Drinking a gallon in one sitting is better than drinking a glass or two throughout the day by sipping it. Not that you would want to drink a gallon but you get the picture. The sugar is only on your teeth for 30 minutes after you have your last sip. So if you are constantly sipping then the sugar is never out of your mouth. I’m a dental hygienist and have to explain this often. My sixth child at age 5 had 4 bright silver crowns installed on his molars. The dentist thought he must have been drinking soda (maybe one a week if he went to his dad’s office and bought one from the machine). It must have been the white grape juice that he drank constantly for about 2 years after weaning at age 28 months. I have quite buying juice altogether now and my youngest has never tasted it at all. Lots of food allergies, so he drinks water, rice milk and one small cup of lightly sweetened decaffeinated tea once a day. I do have to say that NONE of my 4 older children, now ages 14-26 have ever had a cavity. Child 5 goes back next week to have two fillings done….she has had probably 4 in the past. My dentist and I were laughing over the cause of the difference in my children’s tooth health and he and I both think it is because we are much less diligent. I blame it my dh who has night time tooth brushing detail. LOL! I really should do it myself. and Their Effects”. He wrote much on the effects of a poor diet on teeth and overall health. You can read it on line at http://journeytoforever.org/farm_library/price/pricetoc.html. Our 24 yr old daughter just had 6 teeth filled. The last couple of years she has been eating a lot of candy and her diet has changed since growing up where she only had 1 cavity all those years. It was a hard lesson for her. Most people are deficient in magnesium in North America and magnesium is part of the outside coating of teeth. Several good books are The Healing Miracles of Magnesium and also Good Teeth from Birth Until Death… Fluoride is very carcinogenic. Drinking filtered water which takes all the minerals out of the water will cause teeth and your health to break down. 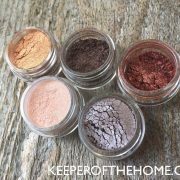 It is much better to just have a filter that takes out say chlorine but leaves the minerals in. We learned this the hard way. A good product that you can find in most health stores is ConcenTrace Minerals and it is high in Magnesium and has 84 minerals in it. It is very inexpensive. One thing that can really break tooth enamel down is a person chewing on a Vit C tablet. Vit C is very acidic. Pop has 10 to 12 teaspoons of sugar in one can so not any better than apple juice. Pop is very acidic too. Just last week a friend of mine who is a nurse at an outpatient surgery center told me they are frequently seeing pediatric dental cases at their surgical center due to poor dietary and dental habits. My dental hygentist told me that she sees a lot of staining due to the sports drinks that children frequently drink. Eating Well recently ran an article on milk/diary farmers and mentioned how milk sales have steadily been decreasing over the years bc of the competition of all the other beverages people are drinking now. Hopefully, many parents will see your article before they have to go through the same thing. My son has only had juice a few times in his little 26 1/2 month old life. I was determined to NOT let him have it too often, if at all. Luckily he prefers water and his soy and almond milk to everything else. He has very white, very strong teeth- no cavities. I brush his teeth twice a day, as I also do with mine. I am 26 years old and have NEVER had one single cavity. It is possible. You have to limit the sugar intake and get them to love fruits and veggies in their natural state rather than candies, juices, or sodas. @Hollaina, Woohoo! I was 30 when I had my first cavity – you’re right – it can be done! Keep up the good work, mama! You might want to research a bit on soy milk, I’ve been hearing that it’s not good to have soy in large quantities. The Weston A. Price foundation has a lot to say on that. I am a homeschool mom of 5 teens. In our home we have a grand total of 1 cavity and a couple of small filled pits. Why? I believe it is not so much the foods acidity but how the foods convert your body into and “acidic environment or alkaline environment. Sugar most definitely creates an acidic body. Learn to bake with stevia or Xylitol ( my favorite) NO juices ( no they are not good for you because they are completely killed by pasteurization.) make smoothies with berries and do some reading on balancing your ph. My family is proof positive it works. But the main thing to look at is how much sugar you are getting in your diet and remember all of the things your body converts to sugar (grains of every kind- there is life after grains) , and starches. Just wanted to weigh in and say that you can’t really use your own family to prove what works one way or the other. 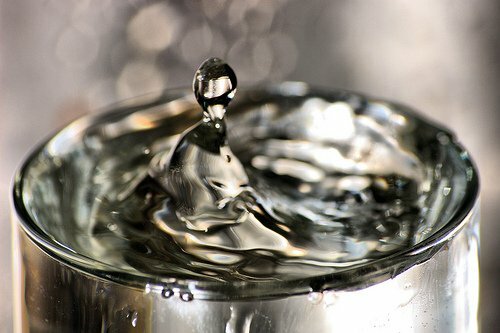 Obviously, water is far better to drink than juice, and generally, that can be seen by looking at the evidence, both experimentally and scientifically. BUT, there are some people whose body chemistry seems to lead more toward tooth decay, just as some are more prone to acne, etc. My teeth, my husband’s, and my childrens’ are white as snow, as are all of my siblings’, EXCEPT one poor brother who ate and drank exactly like the rest of us and has a mouth full of fillings. Some poor mother may read this conversation (the comments, not the post) and think she’s the worst mother in the world, when in reality, her child may have tooth problems anyway, one way or the other. Be careful when you say, “well, I did it this way and this happened, so obviously I did it right.” Sometimes, you just plain old got lucky. And in the process of saying what you said, someone else may be put way down. Obviously the fact that I read this site and others regularly would indicate that I feed my family real, whole, organic foods and drink, but I try very carefully not to judge others for their choices, or blame them for the problems that may come as a result of their decisions. Be thankful for what you know, and the wisdom God has given you, and be careful not to think of yourself above what you ought to think. @Amy Clark, Thank you for your thoughtfulness and sensitivity to other people’s feelings. Sometimes when we get used to doing things a certain way it is easy to forget that there was a time when we didn’t know that method and had to learn that information. Genes definitely play a unique factor in at least part of our outcomes as humans – the classic nature vs. nurture debate, right? Some people can do seemingly everything right and still have poor health in some area. What works for one will not always work for another – just as you shared with the example of your brother. I think all of us that read this blog and comment on the posts are here for the same reason – we love our families and want to improve their health. Even with the intention of being helpful, sometimes in print, (that is lacking in body language and facial expressions) comments can be taken differently than they were intended. It is easy to see you are a compassionate woman. 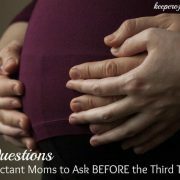 I hope any discouraged moms will look above at Katie’s comment (#9) and my response to her. 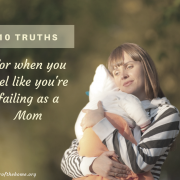 There’s enough things in this world that will heap guilt on us as moms, there’s no need for us to do it to ourselves, right? This is so true about natural sugars still being sugar. I have so many friends that are convinced that if it’s “natural” then there’s nothing that could hurt you right? Well, I hardly give my kids sugar ever. Did you know lemon juice is also one of the worst things for your teeth? This is becasue of the acid not the sugar though. It is so strong it is actually worse for your teeth than sugar because it is so acidic that it burns the enamel off the teeth. We are water drinkers too! 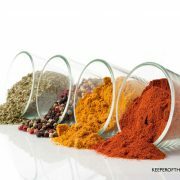 @Jen @ Buy artisan cheese online, And what do we always use in conjunction with lemon? SUGAR!!! Something has got to be in combination with that bitter fruit. Whew! 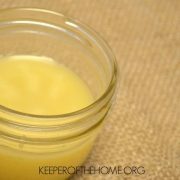 I linked to your homemade cough syrup from Nov 09 on my blog. We preach to only drink water on our site. Juice and milk are treats not staples. They get enough milk in cereal, cheese sandwiches etc. that they don’t need extra and juice really is just sugar water. What’s funny is you wouldn’t believe the flack we get for saying that! I wish more people would realize this, It would not only save hundreds on the grocery bill but also on dental bills! Great post!! I forgot to add that genetics do have a LOT to do with it too. We’ve seen the same thing. 3 kids have great teeth and one is always at the dentist. You do what you can and then don’t worry about the rest! Thanks for the great post. Gets me thinking since my little girl drinks 1:4 juice/water ratio all day, always asking for more! I am so happy she is getting her fluids, I thought that little amount of juice wouldn’t hurt but now I am much more concerned! I have heard that apple juice will rot your teeth many times, and believed it until I met someone who’s child had cavities who had never had juice…just breast milk. 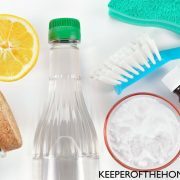 I have since learned that cavities are a potassium, magnesium and other mineral deficiency and have more to do with the body’s pH than any particular food’s pH. Cavities are like osteoporosis, the body leaches minerals from the bones and teeth to maintain it’s blood pH…at all costs, to save your life. The mothers diet during pregnancy as well as medications taken during the pregnancy can also effect teeth. I would recommend the use of Spry gel and using Calcium Bentonite Clay (Living Clay Co.) for a tooth paste. This has “healed” the many early appearing cavities of my breast little boy. Since using the Spry and Calcium Bentonite Clay we have had no more new cavities and the cavities he does have have “healed” up as much as possible. He has never been given juice. I think this little one was effected by my low vitamin D status during pregnancy and several rounds of antibiotics I had to take during my pregnancy. I can’t say it enough….try the calicum bentonite clay. I think this is the biggest factor. It works in many ways to heal and prevent cavities. I initally read a blog post on this and decided to give it a try. We had a little one with 6 cavities on his front teeth and all of his first molars had cavities…what did I have to lose. Everyone was saying to stop the night time breast feeding. My heart told me that would not be the cause. I belive in nature has it right…babies grow and feed at night. Rub a few drops of the Spry (Xylitol) and then rub the clay to clean and coat the teeth–no rinsing. It is beneficial for the clay to stay on the teeth and the mouth. correct me if i’m wrong (i’m actually googling things to show my friend that it’s sugar in juice that causes tooth decay and he says it’s the acid, maybe we’re both right) .. anyways.. decay starts at 5.5 it says, but ACID goes down in number. a PH of 3.0 is much more acidic than 5.5. when you go with a higher number it’s a base.. right??? Carolyn is right. A pH of 3.4 is acidic enough to decay teeth. The lower the number the more acidic a solution is. Lemonade can have a pH as low as 2.0 which is very strong. I agree that juice is horrible for anyone. It really doesnt have any nutritional value. When I was a nurse I had a patient who insisted on giving her 9 month old undiluted juice, even after I told her all the dangers. She laughed when I started diluting it (heavily) to give to the baby even though he shouldnt have been having any at all. It was really heartbreaking – that baby is probably 3 now and I bet he has a lot of dental problems.